The School of Business, Economics and Law at the University of Gothenburg was founded in 1923 as an independent business college and is situated in the centre of the city. In 1971 it became a part of University of Gothenburg. Today, the School of Business, Economics and Law is an independent unit within the University. The School of Business, Economics and Law at the University of Gothenburg is accredited by the three most prestigious international accreditations for business schools. By EQUIS in 2004, by AMBA in 2013 and by AACSB in 2016. This makes it the only business school in Sweden that is what is popularly referred to as “Triple Crown” accredited. 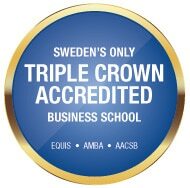 The only Triple Crown accredited business school in Sweden! This exclusive group includes, among others, London Business School, Antai at Shanghai Jiao Tong University, INSEAD in France and Copenhagen Business School. Only around 70 business schools in the world (approx. 0.5%) are “Triple Crown” accredited.